Mol Cell Proteomics, 2015, 10.1074/mcp.M115.049783 mcp.M115.049783. Nature, 2017, 547(7664):453-457. Gefitinib (ZD1839) purchased from Selleck. Perturbation of EGFR by its ligand EGF and gefitinib (ZD-1839 Iressat; inhibits EGFR) produces opposite responses in the predicted EGFR target genes SOCS2 and NR2E1. Mol Syst Biol 2011 7, 486. Gefitinib (ZD1839) purchased from Selleck. Effects of shRNA-mediated RECK depletion on EGFR signaling in MEFs. (a) Immunoblotting (IB) of the indicated proteins in wild-type MEFs transduced with the indicated shRNAs and cultured for 48 h in the presence of 0.1% dimethyl sulfoxide (DMSO; vehicle) or 1 mM gefitinib (S1025, Selleck Chemicals,Houston, TX, USA). (b) Immunoprecipitation from whole lysates of cells from panel a with an anti-phosphorylated tyrosine (pTyr) antibody. Precipitates from 500 mg protein in whole cell lysates (upper) or 20 mg protein in whole cell lysates (lower) were analyzed by IB with anti-EGFR antibody. Oncogene 2010 30, 737-750. Gefitinib (ZD1839) purchased from Selleck. (B–C) LNCaP (B) and LNCaP-AI (C) cells were transiently transfected with sPLA2-IIa(-800)-Luc (0.5 μg). The cells were then treated with Erlotinib (20 μM), Gefitinib (20 μM), Lapatinib (20 μM), CI-1033 (8 μM), LY294002 (20 lM) and Bortezomib (20 μM) without or with EGF (100 ng/ml) for 24 h. Luciferase assay was performed according to a standard protocol with Renilla luciferase as an internal control. Data are presented as the mean (±SD) of duplicate values of a representative experiment that was independently repeated for five times. Carcinogenesis 2010 31, 1948–1955 . Gefitinib (ZD1839) purchased from Selleck. Carcinogenesis 2010 31, 1948–1955. Gefitinib (ZD1839) purchased from Selleck. Suppression of EGFR signaling by Gefitinib is dose dependent and non- toxic at millimolar concentrations.Results from plaque reduction tests of Hep2 cells infected with VACV(12.5pfu/well) treated with a serial dilution of Gefitinib (1000-0.01 m) and analyzed for (A)proliferation as indicator of cytotoxicity,(B) IC50 of plaque size inhibition, (C)dose dependent inhibition of EGFR-ERK1/2signaling and VACV proteins by Western blot analysis (pEGFR detection was obtained from a different experiment with identicals ettings) and (D)dose dependent inhibition of orthopoxvirus genome replication by real-time PCR.Untreated VACV infectedcells and uninfected cells are shown as controls in the right panel. Antiviral Res 2010 89, 64-70. Gefitinib (ZD1839) purchased from Selleck. J Immunother 2011 34(4), 372-81. Gefitinib (ZD1839) purchased from Selleck. Inhibition of 5-HT-induced 5-HT3A and 5-HT3AB receptor currents. Eur J Pharmacol, 2017, 821:21-28. Gefitinib (ZD1839) purchased from Selleck. The EGF-dependent increased association of PCM1 and AZI1 requires EGFR kinase activity. ZD1839 (Iressa)—EGFR tyrosine kinase inhibitor. Mol Biosyst 2011 7, 3223-33. Gefitinib (ZD1839) purchased from Selleck. Oncol Rep, 2017, 37(2):1212-1218. Gefitinib (ZD1839) purchased from Selleck. 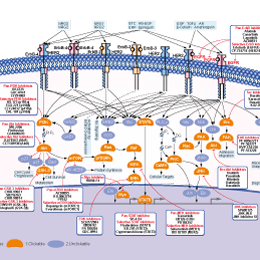 Inhibition of signaling pathway activation in lung tumor cell lines by kinase inhibitors. Lung tumor cells were cultured in 10% FBS until reaching ∼80% confluence and then the cells were starved in serum-free medium for overnight, followed by 4-hour treatment with the inhibitors. Cell lysates were then prepared and used for determination of the pathway activation signals by the CEER assay. Int J Proteomics 2011 215496. Gefitinib (ZD1839) purchased from Selleck. Breast cancer cells were pretreated with 100ng/ml EGF for 15 min and then treated with the indicated concentrations of Gefitinib for 24 hours. 2010 Dr. Zhang of Tianjin Medical University. Gefitinib (ZD1839) purchased from Selleck. MTT assay result. 0-500nM Gefitinib treated with H1299, H358, H25 and HCC827 cell lines by 72h, Proliferation rate was tested. 2010 Dr. Vicky Tin from University of Hong Kong. Gefitinib (ZD1839) purchased from Selleck. Pedersen MW, et al. Br J Cancer. 2005, 93(8), 915-923. Moasser MM, et al. Cancer Res. 2001, 61(19), 7184-7188. Williams KJ, et al. Br J Cancer, 2002, 86, 1157–1161. Ciardiello F, et al. Clin Cancer Res. 2000, 6(5), 2053-2063. Sirotnak FM, et al. Clin Cancer Res. 2000, 6(12), 4885-4892. I try to dissolve Gefitinib (ZD1839) in 0.5% methylcellulose+0.2% Tween 80 for in vivo experiments. However, when I prepare the mixture, it forms precipitates. Exists another way to dissolve completely the compound? S1025 can be dissovled in both 5% DMSO+corn oil and 5% DMSO+30% PEG 300+5% Tween 80+ddH2O at 2.5 mg/ml clearly. It dissolves in DMSO not readily, please sonicate and warm it in water bath at about 45 degree, and dissolve it clearly first. Then add other solvent.